Avrupa Minerals Ltd.’s (AVU:TSX.V; AVPMF:OTC: 8AM:FSE) business model is quite simple: after adding projects to its portfolio, it tries to get them to a drill-ready stage where after it starts looking for a joint venture partner to do the heavy lifting. An excellent example of how the business model works is the joint venture deal on the Slivovo gold project in Kosovo. Avrupa discovered an interesting gold target in the country and allowed Byrnecut to earn an initial stake of 75% after spending a few million dollars on advancing the project. Byrnecut has subsequently increased its stake to 85% after delivering an economic study on the project, and as soon as it reaches a 90% stake, Avrupa’s position will be reduced to a 2% Net Smelter Royalty. The the annual report of the Fraser Institute does a good job in ranking the jurisdictions from the perspective of a mining company. The Fraser Institute looks at countries based on how prospective they are to discover mineralization, but also how good the legal framework is (in some countries you own a mine, and the next day the president’s cousin is the new owner). 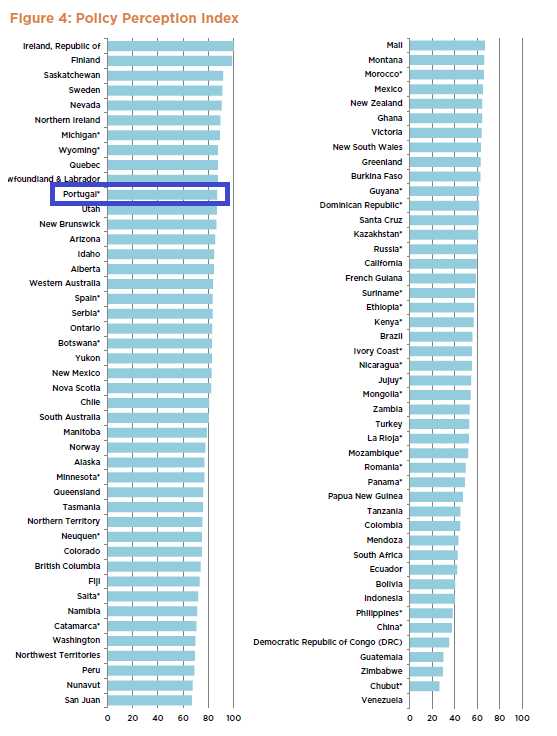 Whereas Portugal isn’t performing too well on the mineral potential index due to the relatively high percentage of the answer “not a deterrent to investment,” which only counts for half the value of a vote for “encourages investment.” But Portugal’s really strong point is the “Policy Perception Index,” where the country scores a stunning 87%, ranking it the 11th best nation to explore in the world, based on the perceived legal framework to conduct exploration and development activities. And that’s what ultimately matters. Avrupa believes it owns some key claims in Portugal that are very prospective (which takes care of the mineral potential side of the index), and knowing the government policy is to be supportive of exploration and mining activities only strengthens Avrupa’s case. As Avrupa is a prospect generator, its portfolio obviously consists of several projects. We will focus on Avrupa’s two core projects: Alvalade and Alvito. While Alvalade is a large copper exploration target, Alvito appears to be a typical IOCG (Iron Oxide-Copper-Gold target). Although both properties are very close to each other, due to the different type of mineralization, they should be seen as two different projects. The Alvalade project is Avrupa’s flagship project, and is located on the western side of the Iberian Pyrite Belt (which has been explored and mined 3,000 years before the Romans occupied the Iberian Peninsula)). Alvalade has been the subject of two previous joint venture agreements, and the previous partners have spent approximately C$10M on exploring the tenements (of which the bulk, US$6.5 million, was spent by Antofagasta (ANTO.L). 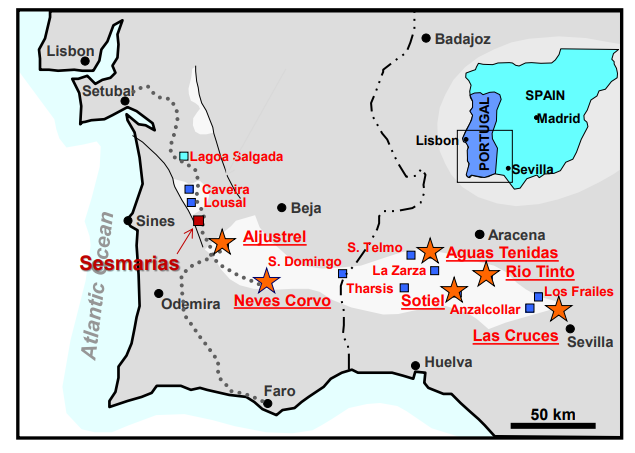 The two previous partners successfully identified several “pods” of massive sulphide mineralization over a strike length of almost 2 kilometers at Sesmarias. Some of the assay results showed high-grade polymetallic mineralization with 10.85 meters of 1.81% copper, 6.95% ZnPb as well as 75 g/t silver. 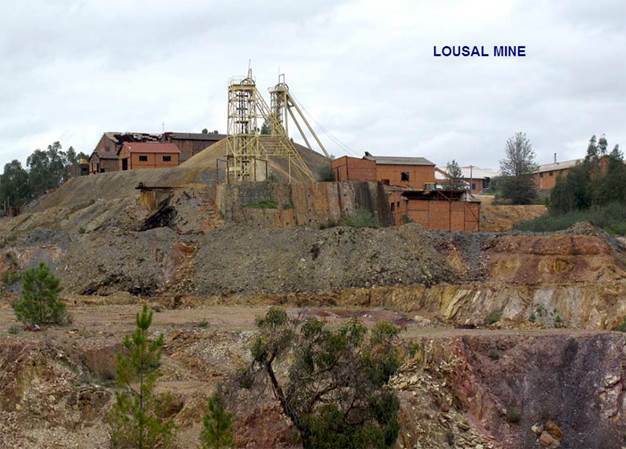 Sesmarias is located just seven kilometers from the past-producing Lousal mine where rock with an average grade of 1.4% zinc, 0.8% lead and 0.7% copper was estimated to be in place. This results in a total gross metal occurrence containing a total of 1.5 billion pounds of zinc, 860 million pounds of lead and approximately 750 million pounds of copper. It’s also interesting to note the pyrite of the mine was used as a source for the sulfur for the production of fertilizer (which was SAPEC’s main business), and perhaps this could provide Avrupa with an attractive revenue stream in the future as well (but the main focus will obviously be on the copper). The Sesmarias target on the Avrupa land package shows similarities to the Lousal mine as the latter also consisted of several mineralized pods. We aren’t saying Alvalade is an exact copy of the Lousal mine, but the basic signatures of a multiple-lens occurrence have already been established. This joint venture agreement was announced in March but still hasn’t been executed yet. Although the exclusivity period has now expired, Avrupa indicated it is still actively pursuing the final execution of this joint venture deal, so let’s hope to see some white smoke soon. Avrupa is already mobilizing a drill crew to get the drill program at Alvalade started as soon as possible. The focus will be on the aforementioned Sesmarias zone, where Avrupa will start drilling at the SES010 lens where it’s targeting a 375 meter long “pod” that works out to be approximately 7.5 million tonnes with an average grade that’s quite typical for the Pyrite Belt (0.3-0.6% copper and 1.5-2.5% ZnPb). The grades aren’t extraordinary high, but it’s definitely doable. After double-checking on the SES010 lens, Avrupa will move the drill rig to a position approximately 150 meters towards the northwest of SES022, where it will be following up on an anomaly. Should Avrupa indeed hit massive sulphide zones (preferably mineralized), an additional 2.5 million tonnes would be added to the overall size of the project. 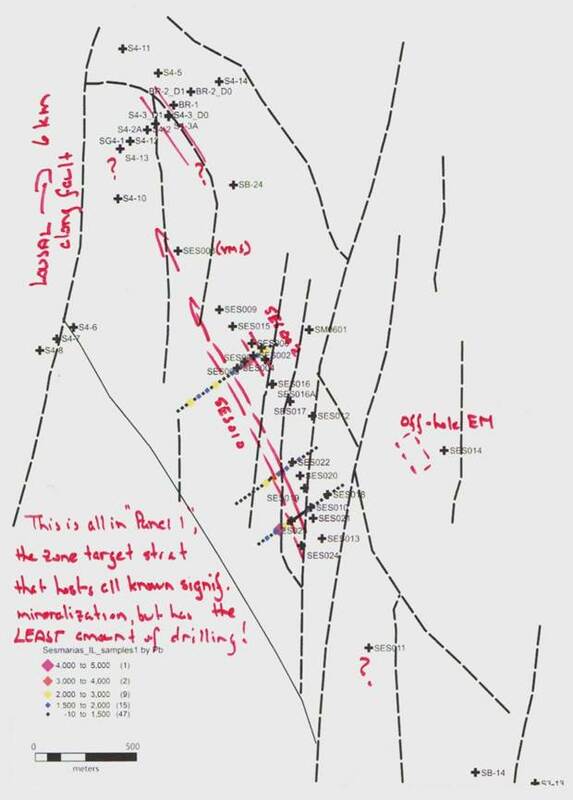 Should this first hole indeed hit the VMS, Avrupa will just “follow the trend” in a northwestern direction (see the map) in an attempt to continue to define a viable resource. It’s important to realize the 50 million tonne Lousal mine is just 6 kilometers northwest of Sesmarias, and along the same trend. This definitely doesn’t mean Avrupa is guaranteed to find something, but the exploration theory the company is trying to confirm makes sense. 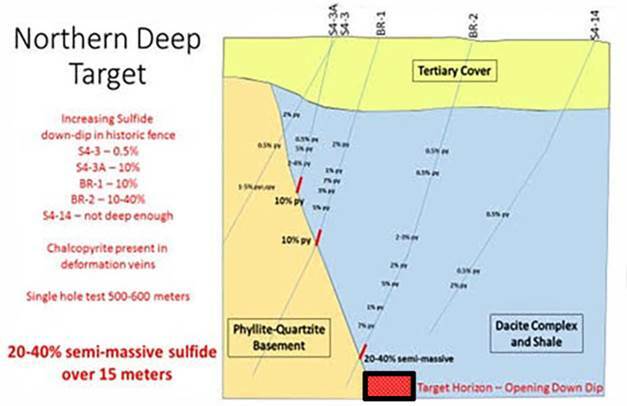 A second drill rig will be directed towards the SES008 area where a previous drill program identified a massive sulphide zone and another mise a la masse anomaly. This will be a deep hole as CEO Kuhn thinks the previous holes just didn’t go deep enough. It’s not always easy to put a value on prospect and project generators, as the very essence of the business model is to generate targets that are per definition conceptual. And while all theoretical concepts appear to be very intriguing, the proof will be in the pudding, and a lot more work will be required to upgrade the prospects to “real” projects. Finding a partner with deep pockets will go a long way towards thoroughly exploring Alvalade (and the other projects in Avrupa’s portfolio), so let’s hope the results of the Alvalade drill program will be good enough to attract a new partner.